Rakugo is a comic storytelling art that has been entertaining the Japanese for over 400 years and is still widely popular in Japan today. The Rakugo storyteller single-handedly creates the humorous side of traditional Japan, playing any number of characters such as Samurai, Geisha, Merchant, Burglar, Child or Drunkard, wearing kimono and sitting on a small cushion using only two small props: a Japanese fan and a hand towel. The audience is encouraged to use their imagination while listening to Rakugo. In the old days, Rakugo was normally performed on the streets, but now “Yose” theaters specializing in Rakugo performance are available, such as “Suehirotei” in Tokyo and “Hanjotei” in Osaka. There is even a national Yose theater in Tokyo that proves how popular Rakugo is as an entertainment to the public. Currently, it is said that 800 professional Rakugo performers exist in Japan. Kaishi Katsura born in Hyogo, was accepted as an apprentice to the Rakugo master, “Bunshi Katsura”, after he graduated from college and became an award winning professional Rakugo performer. In 1997, he started to perform English Rakugo overseas a few times a year while appearing in Yose Theaters in Japan. Kaishi always believed that Rakugo was not just a traditional art or entertainment but a great method to introduce Japanese history and culture to people overseas. People can enjoy Rakugo and learn about Japan at the same time. In 2007, Kaishi was appointed as the Cultural Ambassador by the Agency for Cultural Affairs of Japan and won the performing art grant given by the Japan Foundation the following year. 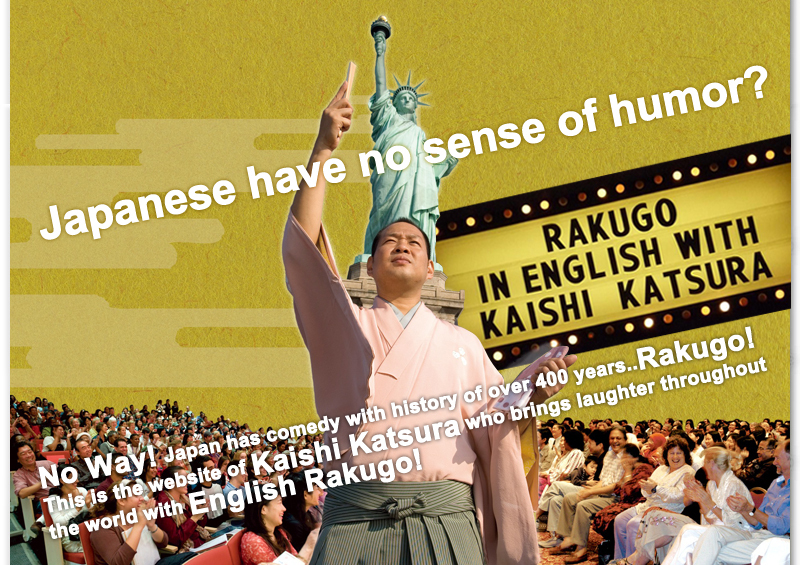 Among those two years, Kaishi traveled to the United States, drove a camping car across the nation from the west to the east and performed English Rakugo wherever he could, from camping sites, restaurants and to renowned theaters such as the Kennedy Center in Washington D.C. and New York Broadway. In addition to the US tours, Kaishi has been invited to 20 different countries such as China, India, Brunei, England, Philippines and has performed in over 100 cities. He also has experience of performing at some of the famous events and stages such as “Just for Laughs” in Canada and at the Sydney Opera House in Australia. In 2014, he received the top rating of 5-Stars at the world’s largest art festival “Edinburgh Festival Fringe” in England. Now, Kaishi and his English Rakugo are featured in English textbooks for junior high school students. He continues his Japanese Rakugo in Japan and English Rakugo in foreign countries. 1999 Received special invitation to perform in Canada for the world’s largest international comedy festival “Just for Laughs”. 2000 Performed in front of IOC President Juan Antonio Samaranch at the Sydney Olympics for the Osaka Olympic bid presentation. 2000 Performed as the first Rakugo performer to ever perform at the Sydney Opera House Concert Hall and drew in 2700 audiences. 2007 Appointed as Cultural Ambassador by the Agency for Cultural Affairs of Japan. 2007 Performed English Rakugo in front of Princess Takamado. 2008 Ventured on a US tour for six months as the Cultural Ambassador and performed 90 times at 33 cities, attracting over 15 thousand audiences. 2008 Performed as a special guest at “Otakon”, the largest anime con in the United States. 2009 Received support from the Japan Foundation and went on his second US tour. Performed in the US and Puerto Rico for two months. 2009 Performed at the National Theater “Kennedy Center” as the first Rakugo performer to ever perform a one-man show. 2010 Performed English Rakugo as a fan event at the APEC in Yokohama. 2012 Appointed special lecturer of Hong Kong Polytechnic University. 2012 Featured in the English textbook for junior high school used nationwide. 2014 Performed as special invitation appearance at the world’s largest arts festival “Edinburgh Festival Fringe” winning the highest rating of 5-Stars. 2014 Performed in front of Caroline Kennedy, the current United States Ambassador to Japan and received praise. Copyright(C) Kaishi Katsura 2006-2015 All Rights Reserved.